Battery Technology - Is the old style Leisure Battery now obsolete? This was the Battery Technology page that we first started in 2012. Most of it is still relevant but it has become a bit unreadable having been updated many times over the years upto the end of 2015. We have therefore tried to create a simpler page that replaces this one, CLICK HERE to view it. Not all Habitation batteries are the same. Please note we do not sell batteries. When we first started this page in 2012 we wrote about how special the Varta/Bosch Powerframe Silver based batteries with regard to Motorhome owners. We wrote about their greater efficiencey. The lighter load they placed on the Charger units, etc. Yes they were Starter based batteries, but then almost all Batteries in the same price class, even those labelled 'Leisure Batteries' were also Starter battery based. The difference with the Bosch S5 and Varta Silver Dynamic (WARNING : the current range of batteries which use these names are different and not applicable see later) was that they had much greater capability than their competitors because of the unique Powerframe technology that came out of the Varta/Bosch 'Stop Start' program. We cut them open, and their competitors, to see what was inside and were impressed by what we saw in the Bosch/Varta. We were also horrified by what we saw in some of the competitors battery construction. Please take with a big pinch of Salt what the labels and the marketing men tell you. We knew that the Varta Silver Dynamic/Bosch S5 charged up more quickly and held their charge better, but most important of all to us, we could see how kind they were to Motorhome battery chargers. Just how much better they were, was not easily quantifiable. We had calculated in tests it was around 30% more efficient on an older battery. We have been the subject of a lot of critisiscm on the Forums, but we now feel vindicated as Varta have released more information about Powerframe AND updated the technology in an existing Motorhome Battery range. That is the potential for a 70% improvement in battery charging efficiency and much greater than we thought. It reinforces what we have said all along. Other battery manufacturers are playing catch-up with their own technology led batteries, like the Northstar from the States, re-inforcing that High Technology Starter batteries really can be good Habitation batteries. This is about High Technology batteries only, not the standard Lucas Starter battery which will not cut it in this context. Bosch/Varta have also introduced Powerframe Technology to the Leisure battery ranges creating an even better battery, the Varta LFD 90 Leisure Battery. All the qualities of the Varta Silver Dynamic/Bosch S5 are there, and Guess what? One of the most advanced, low cost Leisure batteries going, is now officially also a Starter battery. You can use it under the bonnet to Start the engine, as recommended by Varta. The LFD90 is marketed, by Varta, as a dual purpose Deep Cycle Leisure/Starter battery that does both roles very, very well. (800CCA) at freezing point. Yes that is correct, at 0 degrees Centigrade. In the depths of Winter this 'Leisure' battery will have the power to start the engine on a Truck. We have therefore revised our advice slightly. Instead of putting the Varta Silver/Bosch S5 Starter battery in the Habitation area, we are now suggesting installing the Varta LFD90 Leisure Battery as both the Starter Battery and Habitation battery. Under the bonnet and inside the vehicle. Doing this allows the Starter and Habitation battery to be switched around every other year to spread the load of the Habitation area across both batteries. It will also mean that should the Starter battery go flat you have an emergencey backup in the Habitation battery which can be swapped over. For those of you who have supported us, can we say thankyou. UPDATE DECEMBER 2015 : Note that the old Varta Silver Dynamic range has been dropped and the description carried across to the S6 battery range which is very different so DO NOT BUY THE VARTA SILVER DYNAMIC Starter BATTERY ANY LONGER for a Motorhome. The current Silver Dynamic is a very different beast and a lot more expensive. Instead adopt the Deep Cycle Bosch L5 or Varta LFD90 dual purpose Deep Cycle Leisure battery. WHY IS A QUALITY HABITATION BATTERY SO IMPORTANT? In the past, batteries were pretty much the same technology with just small variations, and the focus was always on Deep Discharge capability and the number of Discharge/Recharge cycles. Yet the average Motorhome owner that we see, doesn't use their Motorhome for more than about 2 months/60days a year. Some of this usage will be on EHU, so the average annual Discharge/Recharge count is probably no more than 50 cycles. For a decent average low cost battery, that equates to a life of about 4 years. Similarly the depth of discharge tends to be less than 50%. This is backed up by the number of people 'happy' with the performance of the average sub £100 battery. For these Motorhome owners a £450 Deep Discharge, 4,500 cycle Victron Energy battery isn't a sensible option. Yet almost all the advice focus's on these two qualities, almost to the total exclusion of efficiency, life, safety, flexibility, temperature resilience, usability, cost effectiveness, Self discharge, etc. Even the much vaunted NCC Verified Leisure Battery Scheme focuses solely on Cycles and Depth Of Discharge. When the cost of a new Alternator at £500 plus a new Power distribution unit at £500 can total £1,000 we think a different take on things can save money. Deep Discharge batteries are designed to discharge to very low levels, yet doing so will significantly shorten their life. Even a specialist Long Life Gel battery that is designed to be to 80% discharged will have it's life reduced massively if you use that capability. For example the outstanding Victron Energy Gel Deep Cycle Batteries with a design life of 12 years and over 4,500 cycles will last for just 1,500 cycles if you discharge them regularly to 80% discharge. To put it another way, if you shallow discharge a Victron Energy Gel Deep Cycle battery to no more than 30% it will last 3 times longer than if you deep discharge it. Yet this is a battery SPECIFICALLY designed to deep Discharge. This is not a weakness of the Victron battery, all Deep Discharge batteries from all manufacturers behave the same way. We use the excellent Victron Energy batteries as an example because they are better than most and one of few manufacturers that publish so much detail about the battery. Many people who advocate a Deep Discharge battery are unaware of the penalty you pay in terms of a very much shorter life. In many instances a better option would be a bigger battery bank that you only shallow discharge to 30%, yet this is rarely mentioned in the advice. For example we have seen suggestions on the Forums that an Exide G80 80Ah Gel battery at around £150 is a match for a 100Ah Wet Acid battery because it can be discharged to a greater extent. They also go on to say that it's 7 - 10 year life makes up for the higher cost. They are correct, it can be discharged to a very low depth of Discharge on a regular basis, but not without it's life being shortened significantly. Deep discharge an Exide G80 on a regular basis and it's life could be 3 years as opposed to 8 years when shallow discharged. Another reason Deep Discharge batteries are not always the best option is because some Motorhomes have Inverters of up to 3,000watts drawing almost 300amps from the batteries. There is not a single old style Deep Discharge Leisure battery that we know of designed to handle this power draw over the minutes that the Inverters are running. Proper Deep Discharge Leisure batteries are designed to deliver just a few amps over a long period of time. Using an Inverter with this type of battery will significantly shorten its life. Similarly, many Caravans now have Motor Movers, huge Electric Motors on each wheel, that draw similar amounts of current to a Car Starter Motor. Unlike a Starter Motor that only spins for about 5 seconds these Motors can be running for 5 - 10 minutes and there are 2 of them. That will very quickly degrade an old style Leisure battery. This will in turn strain the charger putting the powerback in. As a Battery ages the tarnishing/corrosion leads to poor conductivity throughout the entire battery, making it both harder to get the stored electricity out and recharge the battery up to put that electricity back. In the left hand image below can be seen the typical Grid corrosion in a conventional battery that becomes a resistance to the flow of electricity. It makes it hard for the electricity to both get into the Battery and draw it out again. The right hand image shows a Varta Silver/Bosch S5 Patented Powerframe Grid at the same age as the conventional corroded Grid. As is clear, it's electrical conductivity is almost as good at old age as new and Varta claim a 70% improvement in electrical flow. When most people think of degradation in a battery they think primarily of the 'Paste' and the way this deteriorates over usage, sometimes breaking away from the Grid. The 'Paste' is important as it determines the amount of Amp Hours a battery can store. In days gone by, the Grid construction was pretty much the same across all batteries, so the 'Paste' and it's qualities was the primary difference when comparing one battery to another. Below can be seen the difference in corrosion between a conventional battery and a Powerframe Varta LFD90. This new vastly superior Grid from Varta transforms the batteries capability, so there are now two primary factors to consider in a Batteries behaviour. Firstly, how well the 'Paste' has survived over time will determine how much power it can store and for how long. Secondly, the condition of the Grid will impact how easy it is to get the electricity into a Battery and how much you lose trying to get it back out. So you could have a low usage, 3 year old battery that had very good 'Paste', so held it's charge, plus had a lot of stored energy. However, because of the corrosion on the Grid (which is more usually time related, not usage) getting that power out could result in a lot of it being lost through poor conductivity. Likewise charging up the battery could be really hard work. This is a simplistic view of a complex subject but broken down to show how you can have a battery with the ability to support a few days Wildcamping yet overloads the Alternator or mains Charger unit. One of the disadvantages of conventional Plate construction is that as the corrosion builds up, it expands outwards and may dislodge the Paste. This is sometimes called Grid Growth. In a Wet Acid battery the paste then often drops to the bottom of the battery sometimes bridging the plates and causing a discharge. So not only is there less material to store the energy but the detached material is actively trying to slowly discharge it. In a Gel battery, the semi 'solid' Gel acid provides support for the plates helping to keep their integrity. So less material becomes detached, the primary reason for their extended life. A Battery is just a vessel that stores Electricity, your battery charger puts a lot of electricity into the battery, for you to take out at a later time. Once you have used all the Electricty, you connect the Battery to a charger to replenish what was used. Your Fresh Water tank is just a storage vessel in the same way. You put in water that you can later draw out the Tap. Unlike the Fresh Water tank that allows you to draw out almost 100% of the water you put in, a Battery will waste some of the Electricity during the charge phase. A good quality battery will probably give back 90% of the energy that is used to charge the battery up. A less efficient new battery could give back only 75% or less. Or to put it another way, you might need to put in 130Ah of electricity to get out 100Ah. When the battery ages internal corrosion builds up requiring, maybe, 130Ah, to get just 100Ah out. Think of the effect that has on your Solar charger? You may have spent another £100 on a MPPT Solar regulator that harvests 25% more power, but then waste those amps because of your choice of batteries. A less efficient Solar regulator with batteries closer to 100% efficiencey is going to win out over a MPPT regulator and tired budget Batteries every time. To understand how internal corrosion affects a batteries capability, imagine it as a water tank with a small hole in the bottom. When the tank is new the water that leaks out is insignificant. But as it gets older the corrosion opens up the hole so more water leaks out. So after 3 years you need to put more water in just to keep the tank topped up. However, as the tank ages the pipe leading out of your tank from the Stop Tap also corrodes and little leaks develop all down the length of the pipe. Whenever you open the tap some Water never makes it into the bucket so you need to have the tap open longer, taking more water from the tank to fill your bucket. Although you are still only filling the same size bucket you did 3 years before, half of it spills onto the floor so the end result is a tank that is much less full than it would have been 3 years previously. To fill the Tank back up now requires the Water Pump to force in a greater quantity of water. However, imagine that the pipe from the Water Pump feeding the tank is becoming restricted by 'furring' so getting all this extra Water into the tank becomes really, really hard work. Not only do we now have to pump in more Water but it has to be done down a narrower pipe and even as we pump it in, it's leaking out. The resultant strain on the Water Pump (Battery Charger) causes a major strain. That analogy is the best we can think of to show how a Battery behaves over time, as the battery ages (which might only be months on a budget Battery) it is harder to get the power in and you waste more of it getting the power out. Additionally, but not always, it may run down more quickly. The above is a simplistic explanation of something very complex but shows most of the issues in normal Motorhome battery use where the Plates have suffered no damage. Because of the way a conventional Plate Corrodes, a Lead Acid Battery (Gel, AGM or Wet) starts its decline from the moment it is manufactured. Hence the importance of buying only freshly manufactured batteries. What Bosch/Varta have done, to return to our analogy above, is build a Water Tank that is made from a special alloy. It suffers no tarnishing, has no leaks. The Inlet/outlet pipes are again specially coated, so no corrosion. Varta/Bosch have found a revolutionary way of making the inlet and outlet pipes bigger, with less friction (Silver/Powerframe Technology) so the water flows in and out of the tank much more easily than most tanks made of Lead. The Powerframe technology makes sure they stay this way. So now the Water Pump (Battery Charger) has half the work to do over a 5 year period. A nice side effect is that the Tank now fills more quickly. The final Bosch technological trick, is to cap the tank so no fluid escapes. This technology has been Patented by Bosch/Varta, it cannot be copied by any other manufacturer. It really is unique to them, placing them head and shoulders above the rest. A Varta Silver/Bosch S5 charges up more quickly than an AGM Battery (please note that we are talking here about a Motorhome environment where an AGM battery will not receive optimum charge, see the AGM page). The Varta Silver Powerframe batteries perform at extremes of temperatures that would damage other batteries. Efficiencey at very low temperatures is better than most rivals, so your Engine has more Cranking Amps available when the temperature drops to freezing. Varta are quoting -30 to +45 degree operating range. Likewise they perform better at higher temperatures, like in Spain, Morrocco, than any other battery in the same price bracket, even outperforming higher cost AGM and Gel which are best avoided if you spend time in a hot clime. The high Silver content of the Varta Silver Dynamic means they don't begin to Gas until higher temperatures are reached. When they do, the fliud is contained and drips back into the battery cells as Water. Only when the temperatures get well beyond bearable will they start to lose fluid. The battery itself will not necessarily suffer degradation because of the absence of corrosion on the Powerframe positive grid. At these same temperatures, which a Varta copes with, AGM and Gel would have started to Gass (yes even Gel and AGM Gass in conditions they don't like) with resultant greater fluid loss. The Gel/AGM internal temperatures would also have caused degradation to the Plate itself. That is assuming the AGM/Gel battery casing has not already exploded. 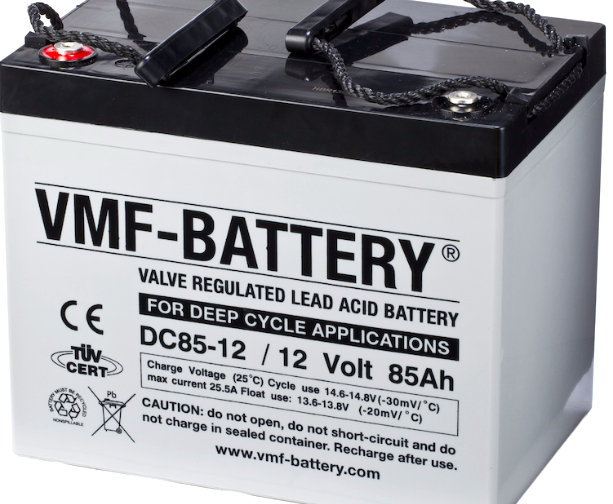 You will read lots of info about AGM and Gel being able to charge and discharge at high temperatures better than a conventional Wet battery, but the Varta Silver Dynamic and LFD range are not ordinary wet batteries. The combination of Powerframe, zero corrosion, High Silver content and the Fluid containment together create a very capable high temperature battery, especially under greater than normal charge/discharge currents. If you holiday in hot climes (or live in Greece like reader Christos Tzoumanekas, see his comments on his poor experience with AGM batteries on the AGM Page) you should find the qualities of the Varta Silver Dynamic superior to most. Even much more expensive batteries. Victron Energy state their AGM batteries have a life of 7 years (using the correct AGM charge program) at 20 degrees C but only 2 years at 40 degrees, showing just how badly AGM can be affected by operation at higher temperatures. Again this is not a Victron Energy battery failing as the Victron batteries are exceptional, it applies to all manufacturers AGM/Gel batteries. There are a handful of specialist high temperature AGM batteries with Cases made from heat conductive material, but they tend to be expensive. See our AGM page for more info. Some motorhome chargers will destroy an AGM battery in months, which will then fail the charger. See our AGM page for more info on AGM, particularly the comment from the Banner web site that AGM Batteries should ONLY be retro-fitted when experienced personnel have assessed IF your Motorhome is suitable. In our experience people are being told AGM is a suitable fit without being asked any questions by Dealers and battery wholesalers. We recently did a survey at 2 Dealers, a Halfords Store and a big battery retailer. They all said an AGM battery could be fitted in our 'imaginary' Motorhome without asking any questions about the Motorhome age, the charger technology or the Alternator. When we then said the charger had a fixed 14.8v output and no AGM charge profile, they all still said an AGM battery was fine, when it would have been destroyed in weeks. Again when we asked what were the advantages of spending twice as much money on an AGM battery, all we got was 'they are better'. Not one of them could tell us the advantages or disadvantages of AGM when used in a Motorhome. AGM batteries are amazing bits of technology in their own right and do have lots of advantages, but not when used as a Motorhome Habitation battery because they are never optimally charged. Bear in mind that if the AGM battery is not a Powerframe, high Silver content battery much of the above about Battery corrosion also applies. At the very best, an AGM battery will have a shorter life if not used on the correct AGM charge profile, 2 - 3 years is typical, which for a £150 'long life' battery is not good value for money. Click HERE for more on why we think AGM are not a suitable fit in most Motorhomes. is because in the majority of Motorhomes the Charger unit supplies both Starter and Habitation Battery. If you have different technology batteries and the charger is optimised for just ONE, how can it be efficient in charging the other? We have a lot of people complaining the Starter Battery doesn't charge properly, 9 times out of ten they have a Gel Habitation battery with the charger optimised for the Gel Habitation battery at the expense of the Wet Acid Starter battery. If your battery is twice the age of the warranty, we suggest you replace it. Be wary of some manufacturers giving budget batteries a longer warranty than they deserve, in our experience they are not honoured. We don't have any affiliation to Varta, Bosch or Johnson Controls, the examples are the best we can find to illustrate a point. We would welcome all feed back, stronger technical content, more information on suppliers and battery manufacturers using advanced technology. Just a reminder that we do not sell Batteries. DO NOT USE BOSCH S5/VARTA SILVER WITH A BATTERY TO BATTERY CHARGER LIKE THE STERLING B2B or CTEK. See below for more information. Caravan Motor Movers are more akin to a car starter motor in the way they place a load on a Caravan battery, budget Leisure batteries are not designed to handle such a load over several minutes with a resultant very short life. As a comparison the photo below shows a Powrtouch Model 1 Electric motor on the right next to a Audi A3 2.0 Diesel Starter motor on the left. .
As you can see the Audi Starter motor is SMALLER and spins for seconds to start the car engine, the 2 bigger Mover electric motors will be spinning for minutes. Some bigger Caravans have 4 motors. The biggest Motormover we have worked on drew 160amps moving the Caravan up a slope. Drawing 100amps for a few seconds is no issue, but drawing that current for a minute could take it's toll. Drawing 160amps for 10 minutes will shorten a batteries life to just months. A conventional Leisure battery is just not designed to handle the load of these Electric Motors, expiring very quickly. The failing battery then overloads the charger causing that to fail prematurely. If your Caravan has a Motor Mover then we recommend you fit a large capacity Varta Silver Powerframe battery. It is designed to handle such a load. If your Caravan is twin axle with 4 electric motors the load on the battery will be even greater so we suggest you consider two batteries to share the load? As all the battery manufacturers advise, rest the battery for 5 minutes every 3 minutes. Many of the Motor Mover problems we see are Battery related. It was nice to see in October 2015 that Roadpro now advocate a Starter battery for a Caravan where a Motor Mover is fitted. It has taken since 2012 to get the message across but there can now be seen lots of other, professionally backed, advice advocating that a Starter battery is more suitable. A & N Motorhome and Caravan Services do not profess to being experts in battery technology. This should be borne in mind when reading the above which is designed to stimulate the reader to do their own research and match it to their style of usage. The Bosch S5 015 is L - 393mm W-175mm H-190mm, Capacity 110ah, 890A CCA, Cost £110 (VARTA SD 610 200 @ £93) This is a very capable cost effective battery, however we find is too long for many battery boxes. Note that Exide G80 (85Ah) Gel batteries often fitted in a MH are 353 x 175 x 190 (incl. terminals) so a match for a 100Ah S5013, Varta H3 (information courtesy of David Chambers).